Ponderosa Mac = 2,271 pts. Snyder’s Full Rage = 1,596 pts. Nic Of Time = 1,040 pts. River’s Edge Bailey = 912 pts. 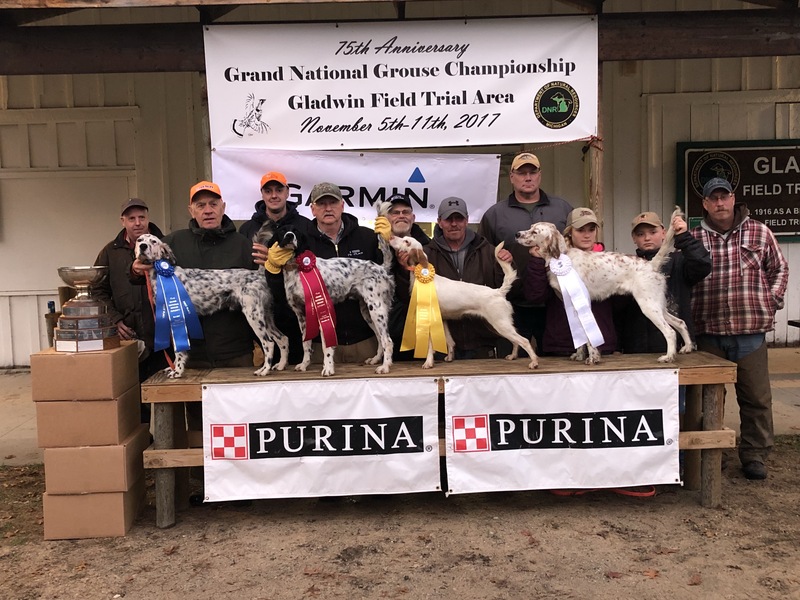 Hirshner’s Grouse Gunner = 864 pts. Blast Zone = 834 pts. Meredith’s Grade Annie = 744 pts. Tim’s Setter Rosie = 720 pts. Chasehill Little Thudd = 668 pts. Shadyhills Whiskey Bonfire = 660 pts. Blast Off = 516 pts. Fernwood Cove Bella = 492 pts. Grouse Trails Pride= 468 pts. Mr. Finnegan = 454 pts. Over the Hill Patty = 416 pts. Caird’s Little Brynn = 410 Pts. Out of the Shadows = 400 pts. Long Gone Juicy = 396 pts. Centerfold Sis = 340 pts. Go Peter B = 300 pts. Snyder’s Pioneer Scout = 292 pts. Chasehill Baby Bella = 288 pts. Hawthorn Lit Up = 252 pts. Herbie’s Asta La Vista = 246 pts. Long Gone Porky = 224 pts. Double Deuce Dexter = 219 pts. Laurel Mt. Princess Zeena = 190 pts. Stokely’s Frankie B = 168 pts. Grouse Hill Pepper Ann = 147 pts. Rockland Ridge McGraw = 130 pts. Kendal Hills Dawson Creek = 130 pts. Lake Effect Tilly = 129 pts. Long Gone Mercedes = 120 pts. Dunroven’s Drifter = 117 pts. Grouse River RocknRoll = 117 pts. Haycreek Opie = 103 pts. Grouse Trails Sharptail = 80 pts. Travel Alert = 78 pts. Straight Forward = 72 pts. Long Gone Studley = 72 pts. Diva Dot = 60 pts. She’s Miss Behavin = 55 pts. Lake Effect Tilly = 45 pts. Ghost Train Cody = 42 pts. Hartland Maisey Mae = 27 pts. After the unfortunate passing of George Johnson, Joe Cammissa has been elected to take on the role of Invitational secretary. His information can be located on the CONTACT page. 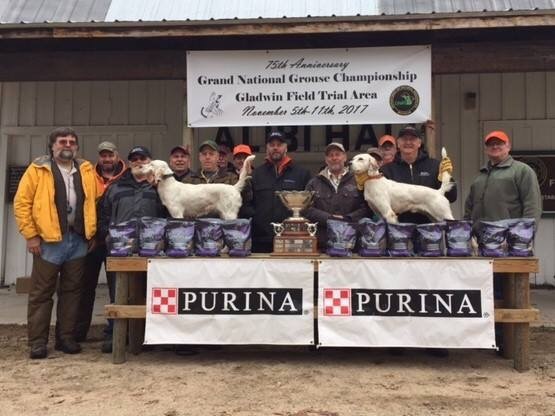 Thank you to Dean Reinke and Purina for supporting the Grouse Futurity. Craig Merlington and Mike Brown have agreed to judge the 2017 Grand National Grouse Futurity on November 5th 2017. Both men are well respected and reside in the host state of Michigan. Early reports from the grounds are plenty of birds and the food and cover that keep them around. 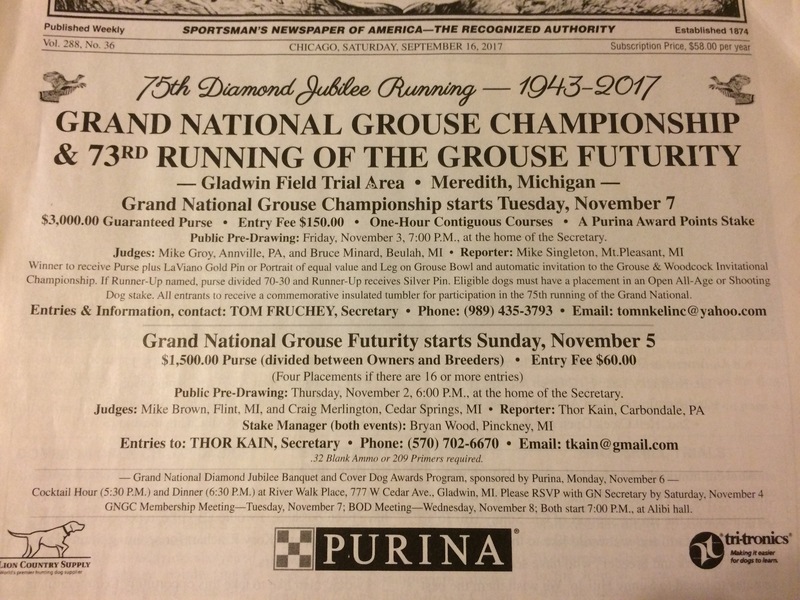 Secretary Tom Frutchey has tallied the votes and is pleased to announce that Mike Groy of Pa, and Bruce Minard of Mi, have accepted the offer to judge the prestigous Grand National Grouse Championship this November in Gladwin Michigan. Both men are well respected and know what it takes for a dog to be named Champion.